Stan Hollandsworth, 51, of Woodbury, Tennessee in Cannon County, has been promoted to Sergeant in the Office of Professional Responsibility (OPR) within the Tennessee Department of Safety, effective May 10, 2010. Prior to his promotion to Sergeant, Hollandsworth served as a Trooper in the Professional Standard Bureau’s Staff Inspections Unit, located at Tennessee Department of Safety Headquarters in Nashville. 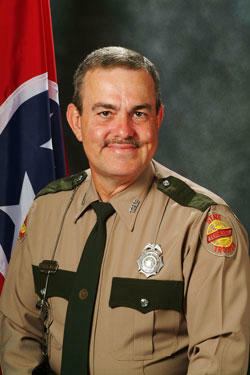 From January 1992 to April 2007, Sergeant Hollandsworth worked as a Road Trooper in Cannon County. Commissioned as a Road Trooper in December 1990, Hollandsworth previously served the State of Tennessee as a Commercial Vehicle Enforcement Officer with the Department of Revenue Motor Vehicle Enforcement Division from 1979 to 1986 when CVE was transferred to the Department of Safety. Hollandsworth continued to serve CVE after it was merged into the Tennessee Highway Patrol. Sgt. Hollandsworth is a 1976 graduate of Central High School and resides in Cannon County with his wife, Sandy. They have two children and one granddaughter, Reese. The Hollandsworth’s 26-year-old daughter Stephanie, is married to Mark Vance. Sgt. Hollandsworth’s son, Shane, 23, recently graduated from MTSU. Congratulations Stan, they got the right man for the job. Congratulations Brother Stan proud of you and your life's work and living. To a Trooper who has earned the honor of being promoted to the rank of Sergeant. You do a great job for Cannon County and the State of Tennessee. Congratulations Stan, well deserved promotion. Keep up the great work.